Home / Extreme Sports / Mixed Martial Arts / MMA / ONE Championship / ONE Championship Global Superheroes / ONE Championships / Who Will Reign as the Champions in the ONE Championship Global Superheroes Fight? Who Will Reign as the Champions in the ONE Championship Global Superheroes Fight? Time to get extreme as we watch the global fighters this Friday, January 26, 2018 at the SM Mall of Asia Arena as they battle for the championship in ONE Championship's ONE Global Superheroes! Catch our very own Igorot pride's Geje Eustaquio as he fight the Kazakhstan's Kairat Akhmetov in the main event dubbed as the Interim Flyweight World Championship. Eustaquio vs Akhmetov, who do you think will take home the golden belt?! 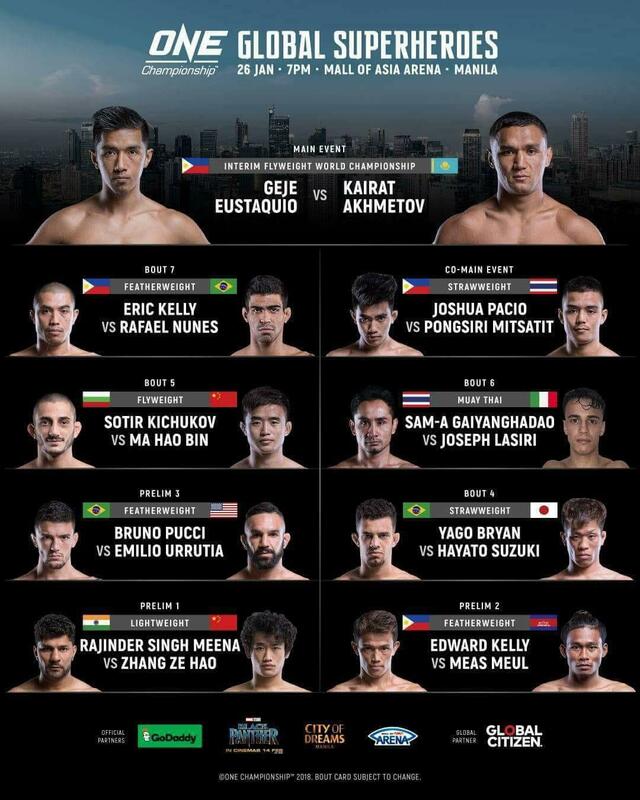 Aside from the two MMA fighters, side events featuring the eight battles of the athlete fighters were also showcase. So are you ready to witness this battle for glory?! Catch them all this Friday night!